428 years ago yesterday, an anointed queen was put to death by the order of her cousin and fellow queen. One of the most tragic and controversial figures in English Tudor and Scottish Stuart history, Mary Stuart, Queen of Scots (1542-1587) died on the scaffold at eight o’clock on the morning of February 8, 1587 at Fotheringhay Castle. After months of anxious delay and tortured soul-searching, Mary’s nearest kinswoman and first cousin once removed, England’s Queen Elizabeth I (1533-1603), had reluctantly signed her death warrant on February 1. 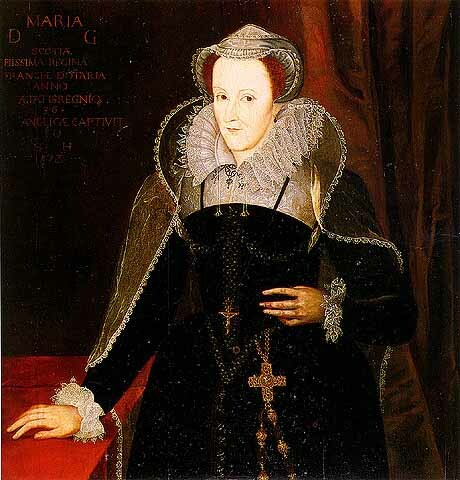 Mary had been tried for treason—a charge of dubious legality since Mary was not an English subject, but Queen of Scotland by birth—and convicted by a court of English noblemen in October 1586. I did not think that the Queen, my sister, would ever have consented to my death; but, God’s will be done. He is my principal witness, that I shall render up my spirit into His hands innocent of any offence against her, and with a pure heart and conscience clear before His divine majesty of the crimes whereof I am accused. That soul is fair unworthy of the joys of heaven, whose body cannot endure for a moment the stroke of the executioner. Here is Queen Mary’s last letter to her English cousin. She wrote this letter to Elizabeth after having been informed of her trial’s foregone conclusion: convicted of conspiring to assassinate her cousin and fellow Queen — a charge Mary vehemently denied to her death — Mary knew her cousin would be pressured to have her executed. Mary’s last letter to her rival and cousin contains a plea for her remains to be conveyed to France after her death, as well as a warning which would haunt Elizabeth for the rest of her life. Now having been informed… of the sentence passed in the last session of your Parliament, and admonished… to prepare myself for the end of my long and weary pilgrimage, I prayed them to return my thanks to you for such agreeable intelligence, and to ask you to grant some things for the relief of my conscience. I will not accuse any person, but sincerely pardon every one, as I desire others, and, above all, God, to pardon me. And since I know that your heart, more than that of any other, ought to be touched by the honour or dishonour of your own blood, and of a Queen, the daughter of a king, I require you, Madam, for the sake of Jesus, that after my enemies have satisfied their black thirst for my innocent blood, you will permit my poor disconsolate servants to remove my corpse, that it may be buried in holy ground, with my ancestors in France, especially the late Queen my mother, since in Scotland the remains of the Kings my predecessors have been outraged, and the churches torn down and profaned. . .
… I beseech the God of mercy and justice to enlighten you with His holy Spirit, and to give me the grace to die in perfect charity, as I endeavour to do, pardoning my death to all those who have either caused or cooperated in it; and this will be my prayer to the end. Accuse me not of presumption if, leaving this world and preparing myself for a better, I remind you will one day to give account of your charge, in like manner as those who preceded you in it, and that my blood and the misery of my country will be remembered, wherefor from the earliest dawn of your comprehension we ought to dispose our minds to make things temporal yield to those of eternity. The 1215 Magna Carta marks the “beginning” of the devolution of monarchical authority, as it was the first time a king had had to recognize himself bound to an authority besides God Himself. The 1689 Glorious Revolution and its English Bill of Rights marked the “end”, the death throes of the British monarchy toward unlimited Parliamentarianism, but what marked “the beginning of the end”? What heralded in the bloodless revolution that transformed Britain from a partly-limited monarchy into a crowned republic where Parliament ruled and monarchs simply reigned? 1689 (William III and Mary II’s granting of the Bill of Rights which recognized the political supremacy of Parliament and granted English Protestants—not Catholics—many basic protections from the Sovereign but not from Parliament) is too recent…. Where may we look to see the origins of the British monarchy’s long descent from a de facto absolutist state under the Tudors to the largely ceremonial figurehead regime we see in place today? We must look, not to the tumultuous reign of the English Stuarts or the increasingly ceremonial reigns of the Hanoverians, but to the Tudors themselves, to a decision made by England’s most beloved Queen, the “Gloriana” of famous memory, Elizabeth I. We must look to two seminal years: 1586 and 1587. In 1586, without any legal precedent, without any attorney to aid her or even the benefit of having her own papers and documents to consult, Mary—Queen of Scots from 1542-1567 and Queen of France from 1559-1560—was tried for treason at the behest of her reigning cousin, Elizabeth I of England. Mary had fled to England in 1568 following her deposition from the Scottish throne seeking Elizabeth’s help and protection, expecting that her cousin and fellow queen would commit money and troops to restore the Catholic Queen to the throne of her rebellious and (since 1560) newly Protestant kingdom. The heavily-pregnant Mary had been forced to sign her abdication in July 1567 while imprisoned at Loch Leven Castle. Her rebellious Protestant lords forced Queen Mary to sign the papers immediately after she had miscarried twins. Following her escape from that castle, Mary’s armies had been twice defeated by Protestant forces under her treacherous half-brother James Stuart, Earl of Moray, who was in Queen Elizabeth’s pay. Elizabeth, troubled by Mary’s lack of judgment and highly controversial marital history (in May 1567 Mary had married her third husband, James Hepburn, the Earl of Bothwell, who was publicly accused of having murdered her estranged second husband, Henry Stuart, Lord Darnley in February 1567), refused to help her cousin. Instead, as she had done previously, Elizabeth secured a Protestant regency in Scotland, ensuring that Mary’s only son and heir, James VI, was raised a Protestant and taught to despise his mother. Elizabeth had Mary imprisoned for the next 19 years, during which time Mary actively plotted to regain her lost freedom and, so she was accused at her trial, to overthrow her Protestant cousin. For in the eyes of Catholic Europe, it was Mary Stuart, not the Protestant Elizabeth Tudor, who was the lawful Queen of England. Mary’s plotting made her the enemy of all English Protestants, and by 1586 Elizabeth was essentially forced by her advisers to bring her Scottish cousin Mary to trial for treason. As with all Tudor treason trials, Mary’s trial verdict was a foregone conclusion, as the jurors were all English nobles subject to Queen Elizabeth. As a Queen in her own right, Mary vehemently denied that the English court had any authority to try her, and, she famously stated, she would “rather die a thousand deaths” than acknowledge herself to be subject to the laws of England. So it came to pass that, on February 1, 1587, Elizabeth I regretfully signed her own cousin and sister queen’s execution warrant. While two medieval English kings, Richard II (1367-1400, r. 1377-1399) and Edward II (1284-1327, r. 1307-1327), had been unlawfully murdered shortly after their illegal deposition from the throne, neither men were executed lawfully; an assassin in the night is entirely different from a public, state-sanctioned, royally-ordered execution. Mary’s state-sanctioned murder, for which all England bears responsibility before God, but especially Queen Elizabeth I who signed Mary’s death warrant, was different from Richard II or Edward II’s killings in that, from the English Protestant point of view, Mary’s execution represented, somehow, incredibly, an entirely legal act in conformity with the existing laws of Parliament. That is what makes it so horrendously appalling. Edward II and Richard Ii were murdered after being deposed — they never freely abdicated. Mary, too, was unlawfully forced to abdicate by her political enemies, but then she was put to death after a formal trial by the English lords acting at Queen Elizabeth’s behest. Walking to her execution dressed as a Catholic martyr, Mary Queen of Scots was beheaded with three strokes of the axe at Fotheringhay Castle on February 8 at the age of 44. The most heinous aspect of the entire spectacle was that Elizabeth, a God-anointed sovereign queen, signed the death warrant of her own cousin and kinswoman, a woman who was, by all right, still the lawful Queen of Scotland the morning she died in February 1587, a forced abdication being null and void under both English and Scottish law. With this execution, a Sovereign Queen had ordered the judicial murder and execution of a fellow Sovereign Queen. A reigning monarch had put to death her own cousin, a former monarch and by birth a Queen regnant. This marked the inevitable beginning of the end. Since Elizabeth, the childless Protestant Virgin Queen, ordered her luckless Catholic cousin Mary’s execution, Mary’s grandson Charles I’s execution, and the execution of King Louis XVI of France and his Queen Marie Antoinette, were all but inevitable. From Mary’s execution on February 8, the world experienced as a horrid reality the notion that a God-anointed monarch could be lawfully and legitimately put to death. From that moment, farewell to true monarchical sovereignty. Update on 28 September 2015: As of three days ago, according to this report by the Scottish Legal News website, and corroborated by the Royal Society of Edinburgh, Mary Stuart, Queen of Scots has been cleared of the slanderous charge of murdering her second husband. Henry Stuart, Lord Darnley and King consort of Scots (tenure 1565-1567, 1545-1567) was found dead with his valet at Kirk o’ Field, Edinburgh in February 1567. The Royal Society of Edinburgh’s panel of expert historians, pathologists, explosive experts, and forensic scientists determined that Darnley was likely assassinated by angry relatives and political rivals furious with him for betraying them after David Rizzio’s March 1566 murder, which Darnley collaborated in and executed in the pregnant Queen’s presence.